Who among us doesn’t have regrets? In life, as in investing, regret is unavoidable. From little things like that extra dessert or glass of wine, to “biggies” like that other career path or words not spoken to a loved one while they were still with us, one can’t avoid these thoughts invading the mind now and then. Most of the time, we are able to plow ahead and put these regrets aside. Keep calling and risk being stuck in the middle of the lake? Try to flag down another boat and ask for a tow? Swim back, get some gas, and bring it back to the stranded passengers? The first option wasn’t working. The second option of flagging someone down on a relatively empty lake looked bleak. The third option of swimming—with a life jacket, of course—promised to be a slow one (I’m no Michael Phelps), but it was an eventual success. The rest of the crew could stay on the pontoon and keep trying options one and two. I wanted to avoid drifting aimlessly and the regret of not getting back to shore sooner. At times, regret is a byproduct of investing. Even the best investors experience this emotion. This past May, several members from our firm attended the Berkshire Hathaway annual meeting, and it was another chance for us to soak in wisdom from Warren Buffett and Charlie Munger. Mr. Buffett reflected on how sorry he was that he didn’t wait longer to invest Berkshire’s cash back in 2008. He remarked that he wished he would’ve waited to invest the cash hoard until the absolute bottom of the market in March of 2009. Mr. Buffett also criticized himself at the 2017 annual meeting for not buying Google. He knew that Berkshire subsidiary, Geico, was paying over ten dollars per advertising click to Google even before they went public. “I blew it,” Buffett lamented. Gilovich goes on the point out in the interview that, in the long term, mistakes of action (as opposed to omission) can be rationalized and become less painful. “People will say, ‘I married the wrong person,’ but they will say, ‘Yeah, that was a mistake, but I wouldn’t have these great kids if I hadn’t done that.’” You can see the mistake of inaction by Buffett—not waiting longer to invest in 2008 or not buying Google—still haunts him almost a decade later. We research dozens of new companies each year that never make it into client accounts. We pass on them for one reason or another: it appears too risky; it’s too expensive; I don’t trust management; the company has an unproven business model; competition is moving in quickly, etc. With each one of these “passes,” we hope we didn’t just create a new, long-lasting regret. As famed Investor, Peter Lynch, once commented, “You don’t get hurt by the things you don’t own.” This seems like a comment made by a guy who was managing some investment regret. In the end, we trust that our process will lead to more delight than regret, and we manage our regret by reflecting on our method for making investment choices. Returns for income-oriented asset classes have not been inspiring so far in 2018. Through June 30th, most bond investments are in negative territory. Investment grade corporate bonds are down 4.4%, long-term treasury bonds are down 3.0%, and high-yield corporate bonds are mostly flat (-0.4%). In aggregate, the U.S. bond market is down 1.6% for the year. While it’s difficult to predict the direction interest rates are headed, we know that rates remain stubbornly low by historical standards. The goal of the Punch Income Strategy is, first and foremost, to produce a durable stream of income from portfolios and, second, to produce capital appreciation. By assembling a portfolio of individual securities with above-average income streams, we believe that over time we can achieve those goals in almost any interest rate environment. To this end, we are working hard to uncover areas of the market that look cheap and out-of-favor and securities that can produce strong cash flows. One area that we find compelling today is energy-related master limited partnerships (MLPs). MLPs are tax-advantaged corporate structures similar to real estate investment trusts (REITs) but that largely invest in energy infrastructure assets like pipelines, terminals, and storage facilities. Going back only a few years, the MLP asset class was a darling among income investors. Driven in part by the shale oil boom and resulting explosion in oil and gas production around the country, these investments attracted significant capital (and had the expensive valuations to prove it). 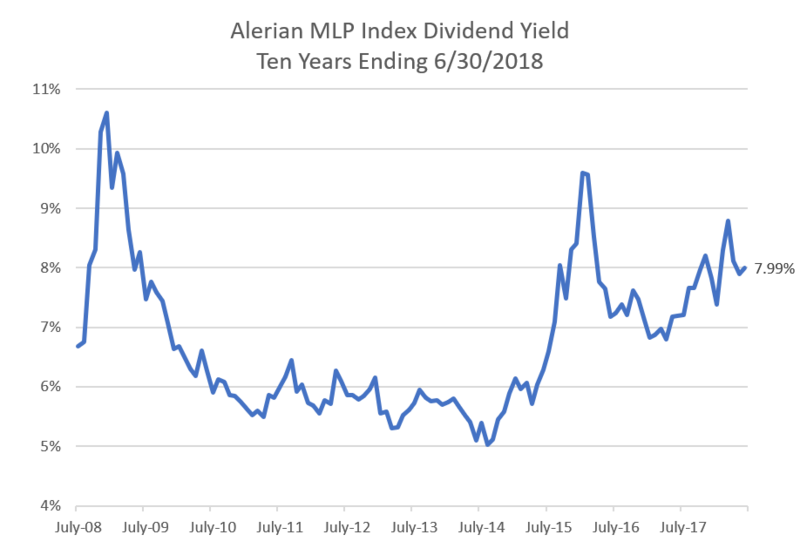 At the peak of the energy boom in mid-2014, the price-to-earnings (P/E) ratio on the Alerian MLP Index hit 37x and its dividend yield was 5%. Fast forward to today, MLPs are deeply out-of-favor and, we believe, enticingly cheap following the energy bust of 2014-15. The same Alerian MLP Index now has a P/E ratio of 16x, its lowest in almost a decade. The index also sports a dividend yield of 8%, significantly higher than yields for utility and REIT shares today (around 3.4% and 4.8%). Moreover, many companies are starting to raise their payouts to shareholders after several years of cutting them. What is curious about their performance this year is that MLPs have notably lagged other energy investments, perhaps owing to a lack of investor enthusiasm. While the S&P 500 energy sector has risen nearly 7% this year on the back of a rebound in crude oil prices, MLP stocks are mostly flat (-0.6%). We think there may be some “catch up” for MLP shares ahead. Our preferred way to invest in MLPs is through closed-end funds that own a basket of individual companies in the industry. Aside from avoiding the messy K-1 tax reporting process every year, these funds take a diversified approach to owning a handful of companies in a cheap asset class. What is more, many of funds trade at meaningful discounts to their net asset value (NAV) because of poor investor enthusiasm for their shares. Large Cap Investing – What’s really under the surface? The Minnesota fishing season officially started on May 12th this year, and each year the roughly ten month long season brings new hope of landing that prized catch. Fishing is one of those sports that looks easy until you get out there and try it. Some get lucky early, but most of us spend the day repeatedly tying on new tackle or replenishing the bait that was just robbed from our hooks. With more than 4,500 lakes considered “fishable” in Minnesota, where you fish can be almost as important as how you fish. The same is true for investing. Fishing for a high quality catch requires two major attributes: patience and experience. You can go to the tackle and bait shop and buy a little bit of everything hoping something works out (like passive index investing), or you can leverage a time-tested pro’s advice and get what you need for a specific area of lakes (like active management). An experienced guide reduces the risk of leaving empty-handed (hopefully!). The patience piece of the equation is largely self-evident to anyone who has put a line in the water for any measurable amount of time. Even when you have the tackle set up just right, it can take hours or even days to land that “keeper.” Investing is no different; patience is a virtue. The Punch Large Cap strategy explores areas of the market that we believe are overlooked or out-of-favor. We look for behaviorally-driven value opportunities that can be bought and held for long periods of time. We avoid the expensive segment of the market where most passive managers are fishing. Consider the current multiples on the S&P 500 Index compared to the multiples for the Punch Large Cap Strategy. At the end of the second quarter, the S&P 500 Index had a P/E ratio of 20.72x and an enterprise value-to-EBITDA (“EV/EBITDA”) ratio of 13.15x. This compares to Punch multiples of 19.43x and 10.26x, respectively. We target lower multiples to provide a financial margin of safety in addition to a behavior margin of safety. As we patiently watch our theses play out, we collect a 3.15% dividend yield (compared to 2.16% for the S&P 500), which helps justify the wait. When it comes to investing and fishing, there are no guarantees, but you can improve your chances by taking a look below the surface to see what’s really going on. A popular pastime on warm summer evenings in Minnesota is the classic car show, an event that draws young and old alike to marvel at memorable cars of the past. Whether it’s muscle cars like Mustangs and Camaros, luxury cars like the Lincoln Continental, or even oddballs like the AMC Gremlin, it’s fun when a town shuts down its main street for a few hours to display vehicles that have been meticulously restored by their owners, both inside and out. Walking down the rows, you quickly notice that the cars are almost always displayed by their proud owners with the hoods up, so passers-by can see the full engine. To me, the hard work of restoring the engine is even more impressive than the shiny paint jobs and polished chrome trim. An engine is an intricate system of parts that need to function in unison to create forward motion. Since many of these cars have already been on the road for so long, engine work is daunting but necessary. If a sixty-year-old car can’t run reliably, what fun is a spiffy exterior? You can’t even drive it to the car show! Shifting gears to small-cap investing (pun intended), the current bull market that began in 2009 now holds the record for being the second-longest on record, at 112 months old (9.3 years). While it has been long, it has not been particularly strong: this market recovery is currently tied for the lowest return since the bottom, at 18% annually (source: Furey Research). In other words, every small-cap bull market since 1938 has seen a higher return than this one. After running for this long and at these rates of return, it is a healthy and necessary exercise to check “under the hood” of the market and examine its fundamentals—not only how much gas is left in the tank, but also if belts are worn or spark plugs need to be replaced. After nine years of a bull market, investors often become less discerning about the quality of companies they own and may take on more risk, as cyclical risks can appear smaller than they are in reality. Nowhere is this risk more apparent today than in the Russell 2000 Index of small-cap companies. Nearly one-quarter (23.9%) of companies in the index are operationally unprofitable today, compared to 20.4% three years ago, and the average debt load of these companies has risen 26% (from 2.3x debt-to-EBITDA in 2015 to 2.9x today). Moreover, the index is more expensive on a median P/E basis than it was in 2015. When an investor owns a passive index fund, they necessarily own all the constituent companies that make up that index. Today, after a long bull run, we believe that risks have accumulated in the Russell 2000 Index that expose investors to lower-quality companies at expensive valuations. When the market cycle eventually turns, we believe these risks will become more apparent. The benefit of active management (rather than simply owning an index fund) is that investors can take an intentional approach to minimizing risks. In the Punch Small Cap Strategy, all but one of our 48 portfolio companies are operationally profitable. The median debt load that they carry on their balance sheets is less than half the median level of the companies in the Russell 2000 Index. We believe that these are fundamentally stronger companies, and our hope is that this strength will keep them running longer and stronger. Who should own your cabin in the future? How should they own the property? How do you talk about this with the future owners? Often cabin owners are tied to their property both financially and emotionally. You likely have spent time, energy, and even sweat and tears making your lake home a cherished place for family gatherings. The space may evoke memories and milestones for your family. Many owners hope that the cabin will continue to be a special place for their children and grandchildren or other family members for a long time. How do you determine who will have the privilege (and obligation) of owning the lake home in the future? It’s possible there isn’t a “right” answer, but it may help to examine your own vision of future use of the property and the unique circumstances of your family. If you have multiple children, are all of them interested in the property or is there one child who is attached to the lake home more than the others? Would your children work well together in a shared ownership arrangement? Some families find that one child has a natural connection to the cabin, but they don’t want to exclude their other children. With a desire to treat children equally, you may feel obligated to offer property ownership equally when, in reality, those less connected to the property would rather receive cash or securities. We are regularly surprised to hear that many cabin owners haven’t talked with their children about the future of the property. We encourage families to make room for honest conversations so that they aren’t operating on assumptions. For example, knowing that your son would rather not set foot in the cabin again while your daughter dreams of retiring there may change the terms of your estate plan or inform a plan for gifting during your lifetime. Once you explore your own intent for the property and understand your family members’ perspectives, you can make a more informed decision to identify future owners of your property. Cabin ownership takes a variety of forms, and like many areas of planning, it’s easy to get lost in the terminology. We find it helpful to start with a basic question to help navigate the options: To what degree do you want to control future use and ownership of your lake home? For some people, it is important that the property stay within the family. Others would be comfortable with broader ownership (spouses of children, for example) or selling the home if circumstances naturally lead to that outcome. From an administrative standpoint, outright transfer of the property by deed is easiest. This could be a good option if you expect that only one of your children will own the cabin in the future. Outright ownership doesn’t require any special ongoing compliance (as opposed to the trust or corporate administration described below). Transferring the property outright by deed means that you are giving full control of your cabin property to the new owner, which may be exactly what you want. When there may be multiple owners, however, outright transfer is more complicated and involves multiple deeds and owning fractional interests in the property as tenants in common. Each owner would have the right to force partition or sale of the property at any time, and the decision-making process for use of the property, maintenance, and improvements can be chaotic. For properties passing to multiple owners, consider using either a trust or a limited liability company to organize ownership, use of the property, and decision-making governance. An irrevocable trust may be best if you want to have more control over who can use the property and who can make ownership decisions. You can form an irrevocable trust either during your lifetime or after your death as part of your estate plan. You decide who can be trustee—this is the person (or group of people) in charge of maintaining the property for the use of the trust beneficiaries. You also decide who will be beneficiaries of the trust. You can limit the beneficiaries to be only certain members of your family, for example, and you may choose whether the trust will continue for one or multiple generations. As added benefits, an irrevocable trust may provide liability protection and reduce estate taxes for the trust beneficiaries. If you want to provide structure for property ownership but you are comfortable with the future owners making changes to that structure, consider forming a limited liability company (“LLC”) to own the property. The company’s owners (members) may manage the company, or you may designate a board of directors to manage the property on behalf of the members. The operating agreement for the company would contain details about how the members or board would make decisions and provide any restrictions on the transfer of LLC units. For example, you might provide in the initial operating agreement that if any member wants to sell or transfer his or her interest in the LLC, he or she must get consent of the other members and the interest must pass to or for the benefit of a lineal descendant. The members would have the ability to make changes to the operating agreement over time as family or financial circumstances change. An LLC may also provide protection for LLC members personally against liabilities that might arise in connection with the property. Sometimes families don’t have clarity around where children will live geographically or what they will want in the future. For situations in which you aren’t sure which family members will want the cabin, you can retain ownership through your lifetime and provide a decision-making process for cabin ownership succession through your estate plan. For example, you might give the person in charge of your estate the power to decide whether to sell the property after your death or distribute it as part of one or more of your children’s shares of inheritance. You could also grant one child a right of first refusal to purchase the property from your estate at the property’s fair market value. Doing so keeps your children’s shares of inheritance equal but allows one child to choose the cabin if his or her future financial circumstances allow. Regardless of the ownership structure you or your family chooses, if there are multiple future owners of the lake home they should create a shared usage agreement. This agreement spells out the process for managing the many day-to-day concerns connected with the cabin. For example: Who coordinates the calendar for using the cabin? Who is responsible for upkeep and maintenance of the property? Who gets to decide about improvements and how are they financed? In a trust, many of these responsibilities may fall to the trustee. When using a LLC, you might have the agreement contained in the corporate governing documents, or your family might want to create a separate, stand-alone usage agreement than can be modified and amended with some regularity. Communication is the most important area of focus for cabin ownership succession. You decide how much or little you’d like the future owners to contribute to the decision-making process about timing and structure, but we encourage you to address ownership succession sooner rather than later. You can avoid confusion over your intentions and provide clarity around your wishes through clear conversations with future owners during your lifetime. Doing so may also spark a broader conversation about your overall financial and estate plan (but don’t let this deter you—this can be a healthy process too). In our experience, most children want to understand their parents’ intent and honor their wishes. We regularly facilitate family conversations about financial and estate planning, including lake home ownership. For the ownership options described above (transfer by deed, trust, LLC, or creation of a shared usage agreement), we would work closely with your accountant and attorney to help coordinate the proper documentation and tax reporting. You may wish to work through the process before bringing your children into the conversation, or you might decide that they should be involved each step of the way. Many clients appreciate using our office as a venue for their family meeting and relying on our ability to answer the technical questions while they communicate their intent and their family values. As your advisors, we encourage you to lean on us for help in this process. If you’d like to schedule a discussion at a mutually agreeable Adirondack chair of your choosing, we would be amenable to that too. We’ll bring the beverages!